The Supreme Court, interpreting Section 29A(c) of the Insolvency and Bankruptcy Code, 2016, has observed the stage of ineligibility attaches when the resolution plan is submitted by a resolution applicant and not any anterior stage. 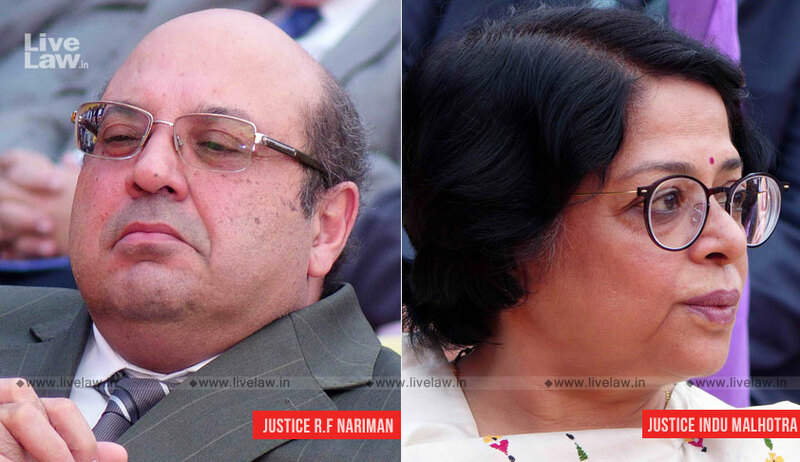 The bench comprising Justice Rohinton Fali Nariman and Justice Indu Malhotra in Arcelormittal India Private Limited vs. Satish Kumar Gupta also held that the time limit for completion of the insolvency resolution process as laid down in Section 12 is mandatory and it cannot be extended beyond 270 days. Interpreting the Section 29A(c), the bench observed that any person who wishes to submit a resolution plan, if he or it does so acting jointly, or in concert with other persons, which person or other persons happen to either manage or control or be promoters of a corporate debtor, who is classified as a non-performing asset and whose debts have not been paid off for a period of at least one year before commencement of the corporate insolvency resolution process, becomes ineligible to submit a resolution plan. The bench also added that any person who wishes to submit a resolution plan acting jointly or in concert with other persons, any of whom may either manage, control or be a promoter of a corporate debtor classified as a non-performing asset, must first pay off the debt of the said corporate debtor classified as a non-performing asset in order to become eligible under Section 29A(c). The bench, however disagreed with submissions made by Senior Advocate Abhishek Singhwi that proviso to Section 29A(c) be interpreted to make it workable, and create a situation so that banks can recover the maximum possible amounts from the NPAs generally, and not merely from the NPAs of the corporate debtor in respect of which it is receiving resolution plans. The judgment also examines the scope of other sub clauses of Section 29A as well. It also explains corporate insolvency resolution process is to work from the inception. Before admission of an application under Section 7 by a financial creditor, the Adjudicating Authority is, under Section 7(4), to first ascertain the existence of a default within 14 days of receipt of the application, as specified in Section 7(4). Upon satisfaction that such default has occurred, it may then admit such application, subject to rectification of defects, which the proviso in Section 7(5) says must be done within 7 days of receipt of such notice from the Adjudicating Authority by the applicant. The time frame within which ascertainment of default is to take place, as well as the time within which the defect is to be rectified, have both been held by a judgment of this Court to be directory in nature, the reason being that the stage of these provisions is before admission of the application. The corporate insolvency resolution process commences from the date of admission of the application vide Section 7(6). Section 7(7) makes it incumbent upon the Adjudicating Authority to communicate the order accepting or rejecting the application to the financial creditor and the corporate debtor within a period of 7 days of such admission or rejection. The time limit for completion of the insolvency resolution process is laid down in Section 12. A period of 180 days from the date of admission of the application is given by Section 12(1). This is extendable by a maximum period of 90 days only if the Committee of Creditors, by a vote of 66%, votes to extend the said period, and only if the Adjudicating Authority is satisfied that such process cannot be completed within 180 days. The authority may then, by order, extend the duration of such process by a maximum period of 90 days (see Sections 12(2) and 12(3)). What is also of importance is the proviso to Section 12(3) which states that any extension of the period under Section 12 cannot be granted more than once. This has to be read with the third proviso to Section 30(4), which states that the maximum period of 30 days mentioned in the second proviso is allowable as the only exception to the extension of the aforesaid period not being granted more than once. What is important to note is that a consequence is provided, in the event that the said period ends either without receipt of a resolution plan or after rejection of a resolution plan under Section 31. This consequence is provided by Section 33, which makes it clear that when either of these two contingencies occurs, the corporate debtor is required to be liquidated in the manner laid down in Chapter III. Section 12, construed in the light of the object sought to be achieved by the Code, and in the light of the consequence provided by Section 33, therefore, makes it clear that the periods previously mentioned are mandatory and cannot be extended. In fact, even the literal language of Section 12(1) makes it clear that the provision must read as being mandatory. The expression “shall be completed” is used. Further, sub-section (3) makes it clear that the duration of 180 days may be extended further “but not exceeding 90 days”, making it clear that a maximum of 270 days is laid down statutorily. Also, the proviso to Section 12 makes it clear that the extension “shall not be granted more than once”. Under Sections 13 to 15, a moratorium is declared; a public announcement of the initiation of the corporate insolvency resolution process and call for submission of claims is made; and an Interim Resolution Professional is to be appointed under Section 16 of the Code. This action is to be completed by the Adjudicating Authority within a period of 14 days from the insolvency commencement date, i.e., the date of admission of the application under Section 7 by the Adjudicating Authority. Under Section 17, the corporate debtor’s affairs are to be managed by the Interim Resolution Professional so appointed, and the Board of Directors of the corporate debtor shall stand superseded. The officers and managers of the corporate debtor are now to report to the Interim Resolution Professional, who has the authority to act on behalf of the corporate debtor. Under Section 18(1), some of the important duties of this Interim Resolution Professional are set out, which are to collect all information relating to the financial position of the corporate debtor and, most importantly, to constitute a Committee of Creditors. That this has to be done at the very earliest, is clear from the scheme of the corporate insolvency resolution process which, as has been stated earlier, cannot exceed the maximum period of 270 days from the date of admission of the financial creditors’ application. Under Section 21, the Interim Resolution Professional is to constitute this Committee of Creditors after collating all claims received against the corporate debtor and after determination of the financial position of the corporate debtor, both of which need to be done at the very earliest. This Committee of Creditors is to comprise of financial creditors of the corporate debtor. All decisions of this Committee of Creditors are to be taken by a majority vote of not less than 51% of the voting share of each financial creditor. Under Section 22, the first meeting of the Committee of Creditors is to be held within 7 days of its constitution in order to appoint a Resolution Professional. The Committee of Creditors either continues the Interim Resolution Professional or replaces the Interim Resolution Professional by a majority vote of 66%. The application to replace the Interim Resolution Professional is then to be sent to the Adjudicating Authority, who is to forward the same to the Insolvency and Bankruptcy Board of India (hereinafter referred to as the “IBBI”) for confirmation. Upon such confirmation, the Adjudicating Authority then appoints the Resolution Professional. In case the IBBI does not confirm the name of the proposed Resolution Professional within 10 days of receipt of the same, the Adjudicating Authority is then to direct the Interim Resolution Professional to continue to function as the Resolution Professional until such time as the IBBI confirms the appointment of the Resolution Professional. It is this Resolution Professional who is then to conduct the corporate insolvency resolution process, which really begins at this stage (see Section 23). Section 25 then lays down some of the duties of this Resolution Professional, which are to continue the business operations of the corporate debtor, subject to the prior approval of the Committee of Creditors over the matters stated in Section 28. One of the important duties of the Resolution Professional under Section 25 is to invite prospective resolution applicants to submit resolution plans. Under Section 29, the Resolution Professional is to prepare an information memorandum giving relevant information, as may be specified by the IBBI, to persons interested in formulating a resolution plan. Section 30 is an important provision in that a resolution applicant may submit a resolution plan to the Resolution Professional, who is then to examine the said plan to see that it conforms to the requirements of Section 30(2). Once this plan conforms to such requirements, the plan is then to be presented to the Committee of Creditors for its approval under Section 30(3). This can then be approved by the Committee of Creditors by a vote of not less than 66% under sub-section (4). What is important to note is that the Committee of Creditors shall not approve a resolution plan where the resolution applicant is ineligible under Section 29A, and may require the Resolution Professional to invite a fresh resolution plan where no other resolution plan is available. Once approved by the Committee of Creditors, the resolution plan is to be submitted to the Adjudicating Authority under Section 31 of the Code. It is at this stage that a judicial mind is applied by the Adjudicating Authority to the resolution plan so submitted, who then, after being satisfied that the plan meets (or does not meet) the requirements mentioned in Section 30, may either approve or reject such plan. An appeal from an order approving such plan is only on the limited grounds laid down in Section 61(3). However, an appeal from an order rejecting a resolution plan would also lie under Section 61. As has been stated hereinbefore, the liquidation process gets initiated under Section 33 if, (1) either no resolution plan is submitted within the time specified under Section 12, or a resolution plan has been rejected by the Adjudicating Authority; (2) where the Resolution Professional, before confirmation of the resolution plan, intimates the Adjudicating Authority of the decision of the Committee of Creditors to liquidate the corporate debtor; or (3) where the resolution plan approved by the Adjudicating Authority is contravened by the concerned corporate debtor. Any person other than the corporate debtor whose interests are prejudicially affected by such contravention may apply to the Adjudicating Authority, who may then pass a liquidation order on such application. The bench also observed that where a resolution plan is upheld by the Appellate Authority, either by way of allowing or dismissing an appeal before it, the period of time taken in litigation ought to be excluded. “This is not to say that the NCLT and NCLAT will be tardy in decision making. This is only to say that in the event of the NCLT, or the NCLAT, or this Court taking time to decide an application beyond the period of 270 days, the time taken in legal proceedings to decide the matter cannot possibly be excluded, as otherwise a good resolution plan may have to be shelved, resulting in corporate death, and the consequent displacement of employees and workers.”, the bench added.